In a way the Whitcomb’s story is reminiscent of the history at Moscow’s Metropol. It’s not so dramatic — the Metropol was besieged for six days in 1917 and later hosted many of Lenin’s speeches — but there’s something parallel in the buildings’ 20th-century histories as hotels and head offices by turns. Both buildings are huge old piles created at the turn of the last century to serve as respectable long-term residences and meeting places as well as for overnight stays. Each has been an administrative center for painful and harmful official decisions, has outlasted a period of badly faded elegance, and today serves tourists and business travelers who may know little about previous occupants. Above is a picture of the Whitcomb building seen in profile from Eighth Street, just to show how very far the Whitcomb extends into the block from its broad Market Street facade. You have to use search terms specific to the incarceration of Japanese Americans to arrive at the building’s story during World War II. The Whitcomb housed the Wartime Civil Control Administration (WCCA) and the War Relocation Authority (WRA) beginning in March 1942. As the Densho Encyclopedia recounts, both entities were concerned with the tracking and detention of Japanese Americans and administration of their confinement. Placing special restrictions on previously free people; bringing the restricted people, mainly by bus, to “assembly centers”; sending the assembly center inmates, mainly by train, to remote inland concentration camps. Keeping them there under guard. Setting conditions for their departure. 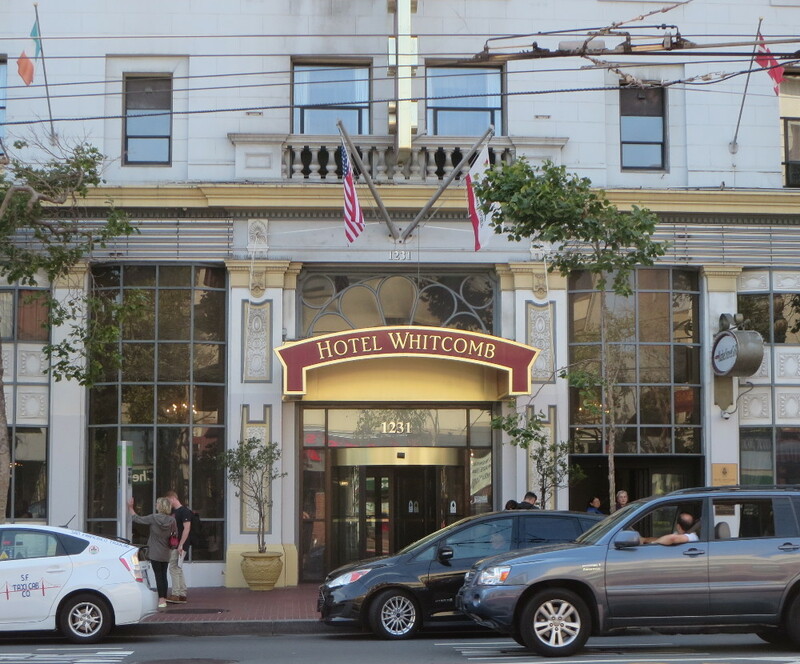 The Whitcomb Hotel is in my neighborhood. 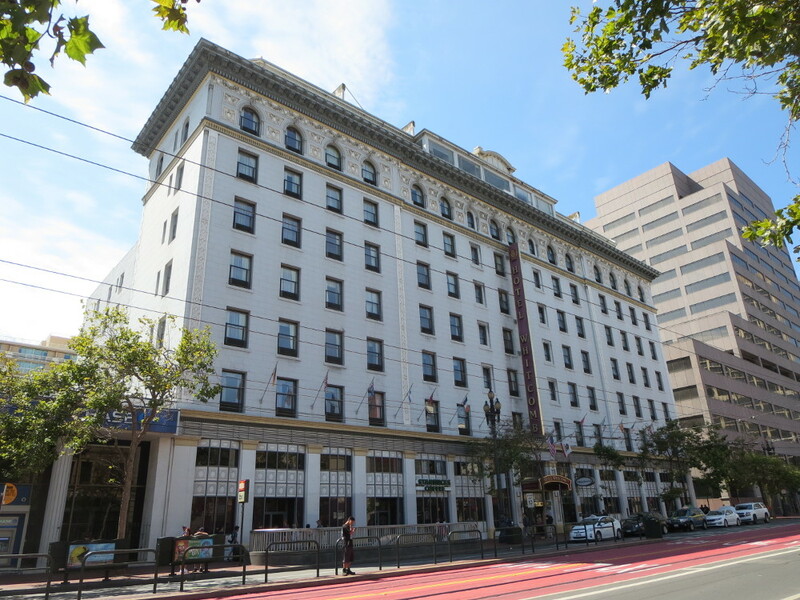 It’s part of the faded elegance, now re-burnishing, at the corner of Eighth and Market Streets in San Francisco. 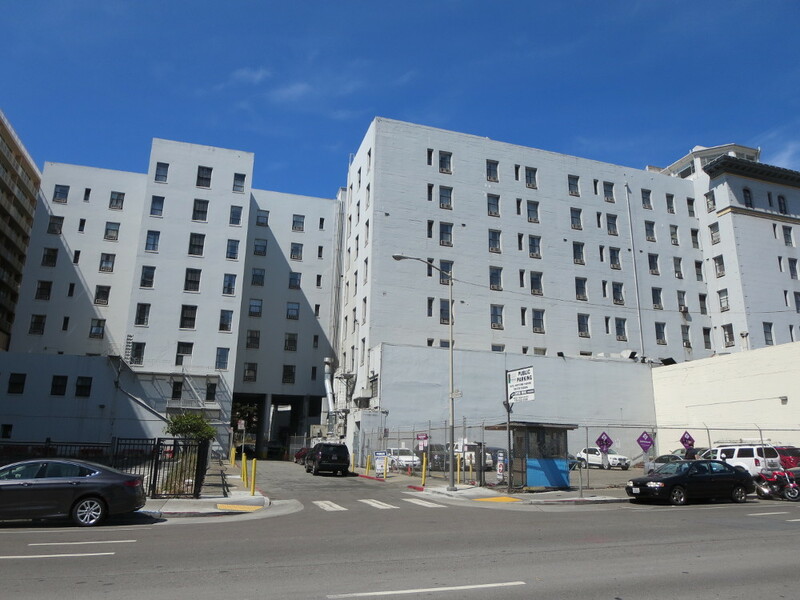 For years we all knew it as the Ramada; now it has reverted to its old name. 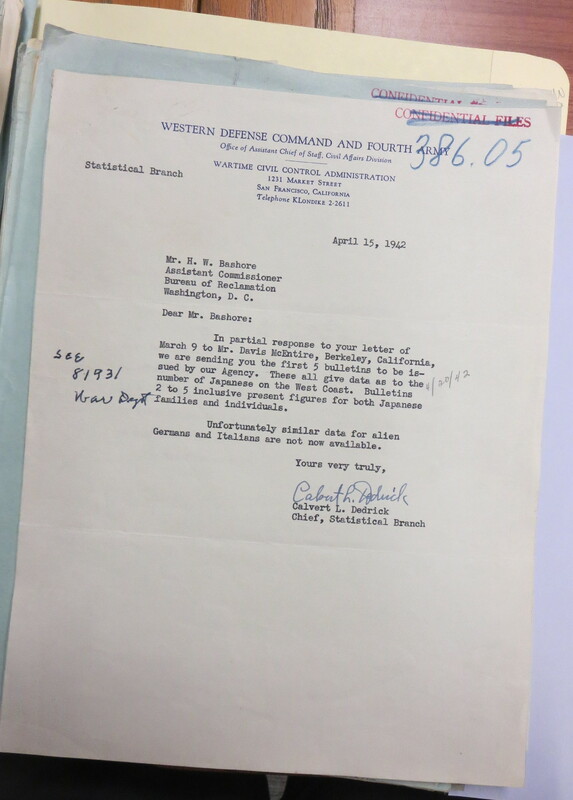 In Denver, at the National Archives, it was jolting to find the Whitcomb’s familiar name and address printed in the letterheads of routine but chilling memoranda about the creation of concentration camps. This one, for example, in April 1942. (Image at right.) On the WRA’s Whitcomb Hotel letterhead, WRA Regional Director E.R. 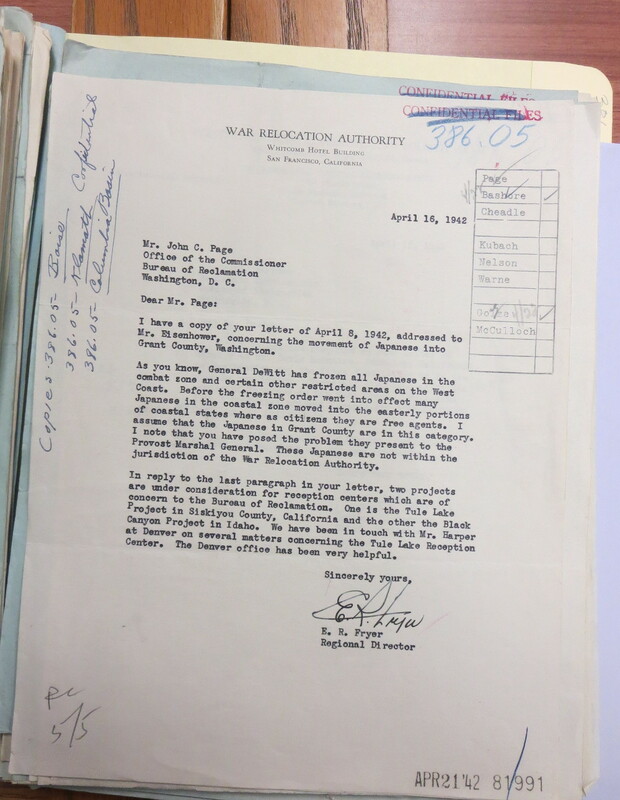 Fryer writes to John C. Page in the Commissioner’s office at the Bureau of Reclamation. He mentions as a “problem” the “free agent” status of Japanese Americans in inland Grant County, Washington, outside the coastal military zone as of that time. He notes the WRA is considering two Bureau of Reclamation sites for camp sites: the Black Canyon project in Idaho and the “Tule Lake Project in Siskiyou, County, California” (sic). (Click to enlarge the document image.) In fact the WRA placed three of its ten large camps on Reclamation lands. One was the Tule Lake camp — which, to be technically correct, was in the Tule Lake Unit of the Klamath Project, just over the Siskiyou County line into Modoc County. The other Reclamation sites were the northernmost inland camps, Minidoka and Heart Mountain. The letterhead gives a phone number for the WCCA: “KLondike 2-2611.” Lots of local-government phone numbers and some South of Market private phones still use that “KLondike” prefix of “55”. The officials who were dictating memos that would send their neighbors to camps in the desert were part of a larger bustle that arrived on Market Street with the start of the war. They may have felt their work was analogous to that of other wartime bureaucracies. Or not. Reportedly Milton Eisenhower couldn’t sleep at night while he headed the WRA, and eventually he declined to continue the work. His successor, Dillon Myer, claimed to have slept perfectly well. 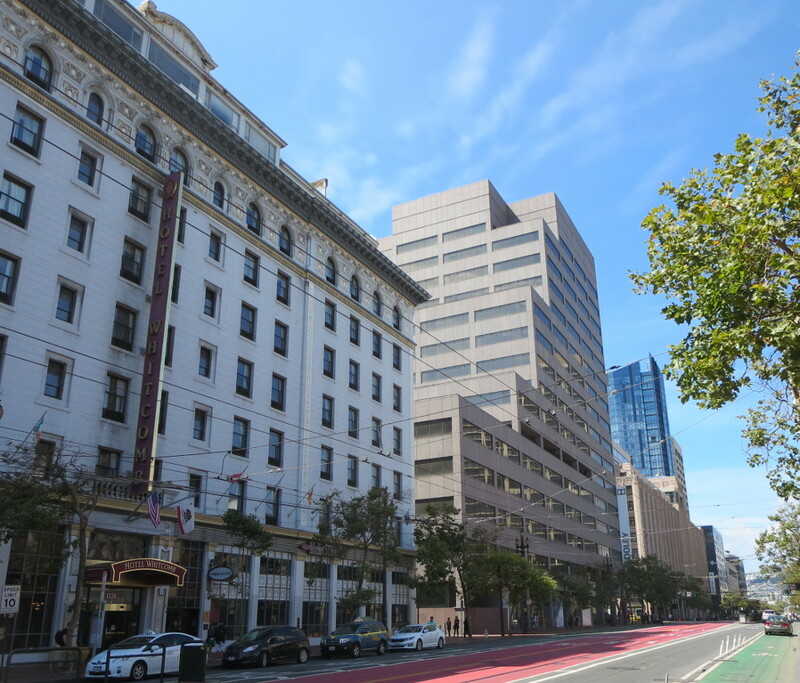 As shown in the photo below, looking west along Market, the Whitcomb is separated by just one large building from the former Furniture Mart, now Twitter headquarters. During World War II, the Mart building, which is also a blocky stone-faced Deco monster of a place, housed branches of the Office of Price Administration and the War Labor Board. At the Mart building, OPA employed Jessica Mitford, Doris Brin, and many others to enforce price restrictions for the duration. Mitford’s husband Bob Treuhaft was with the War Labor Board. In her second memoir, A Fine Old Conflict, Mitford gives a typically jaunty account of battling the Apartment House Owners’ Association over rent controls and innocently trampling the Fourth Amendment in a records search at a machine shop. She also recounts physically tackling an Examiner photographer who meant to report on her status as a minor celebrity. Jessica Mitford’s claim to fame at the time was being sister-in-law to the imprisoned head of the English Fascists, Oswald Mosley. Her family relation to an actual enemy leader (of whom she however disapproved fiercely) did not produce any restriction on her personal freedom of movement or residence — though her generic “alien” status did cause a brief hitch in her U.S. government employment. Meanwhile, many in Jessica Mitford’s personal circle were Communist Party members or supporters. Despite the Mosley business, the Communists let her join up. Meanwhile the CP chose to suspend all of its Japanese American members after Pearl Harbor. Even devoted Communist waterfront organizer Karl Yoneda was suspended. Yoneda writes in his memoir, Ganbatte, that he and other members who had been expelled for their ancestry “decided that this was not the time to register a protest” because they felt the “urgent priority” was to join the CP’s part of the war effort against overseas fascism. Later he realized he should have protested at once. Yoneda was threatened by some fellow inmates in Manzanar over his left-wing politics — where the FBI, unlike the CP, fully endorsed his loyalty. He got out of the camp system into the U.S. Military Intelligence Service, where he served with distinction. A Fine Old Conflict, as far as it goes, gives a vivid picture of the “war work” world on Market Street, and of left-wing activists’ political environment during the war. Yet it doesn’t mention what was going on just a block away at the Whitcomb Hotel. You wonder who heard what, who knew what, who said what, who spoke up quietly off the record, who consciously chose not to object. What could have been different. Why. Cindy — thanks for the great historical/architectural piece on the Whitcomb and for the reference in it to this post. http://www.artandarchitecturetours.com/?p=11636 Amazing what can become unobtrusive in a city.